Similar to the previous Match! version 1, you can define which steps the program should carry out if another step has been accomplished. For example, you can tell Match! to process raw data automatically immediately after they have been imported. In addition to the option to set the automatic options for each individual step, you can now also select among several so-called "user levels" at the top of the 'Batch' options page. The user levels define certain sets of automatic options that have shown to be reasonable. For example, the "Beginner" level lets Match! perform the complete phase identification procedure automatically, while on the "Expert" level you have to run every single step on your own. Of course, you can also save your own batch options settings as new 'user levels'. Finally, it should also be noted that the new Match! version can be controlled from external programs using a batch script that Match! will follow. 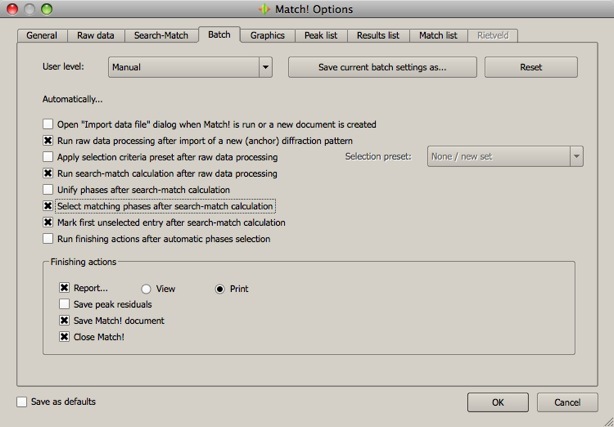 The file name of this batch script must be given as a "command line parameter" when the Match! program executable is invoked.